It's been quite an historic time in Paris this week with Lance Armstrong, a cancer survivor, winning a record seventh Tour de France and retiring while still on top of the cycling world. Eight years ago, it was a different story. Armstrong was trying to make it back as a professional racer after his battle with cancer and he had not yet won the Tour de France. And Harry Smith was "on the bike, suffering like a dog," says Armstrong, recalled his first meeting with The Early Show co-anchor. "I'll never forget. I dropped you on that hill outside of Santa Barbara. You were stuck to the road. We could probably pull up that footage." Yes, the footage exists, and it shows Smith breathing heavy while cycling. Armstrong was by his side, smiling. "You want me to show you a race pace?" Armstrong asked Smith. "Yeah," Smith said but catching his breath added, "In a minute. Let's get over this hill first." 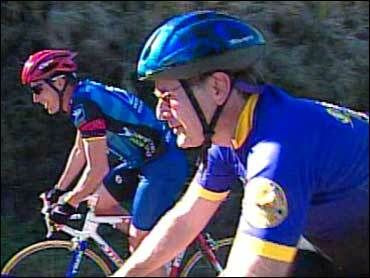 Armstrong clarified, "I'm taking on the hill." And he took off. Fast-forward in time to the interview, Armstrong apologizes to Smith. "Sorry," he says. "Sorry I dug it up." For the record, the footage shows Armstrong looking back, with no Smith in sight. Turning to the camera, Armstrong says, "I can't drop him." Armstrong says he did that because "it was flat. You see, it's too easy to draft." Recalling their first meeting, Smith notes Armstrong said cancer was the best thing that happened to him because when he used to go over to train for the Tour de France, all he could think about was getting back home. That's when he realized that life is something you have to grab on to with everything you've got.